When we talk about standard fruits, of course we have to mention the watermelon, its flavor coloring our fondest memories of summer vacation. 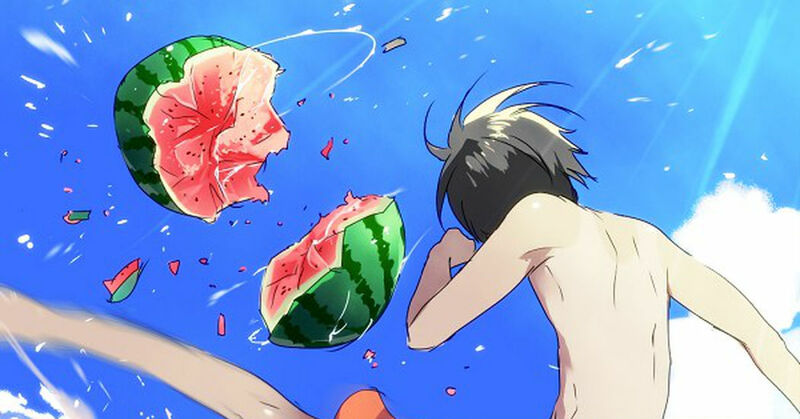 Many people still enjoy it not only as a dessert but also in a game of Suikawari [watermelon splitting game]. Moreover, as watermelon is high in nutritional value, it has been found effective in treating cases of heat stroke. Recently, the watermelon has also been gaining attention as a raw material for sculpting, as well as an ingredient in several methods of dieting. We are proud to present a special edition of illustrations featuring the Fuubutsushi [seasonal] delicious watermelon!